Russell Mullins is a former Secret Service officer who is working for a private protection firm in Washington, D.C. He has been assigned to guard Paul Luguire, a Federal Reserve executive and its chief liaison with the U.S. Treasury, and the two have become quite friendly. So when Mullins hears that Luguire has committed suicide, he can't believe that's what really happened ~ and he's determined to uncover the truth. 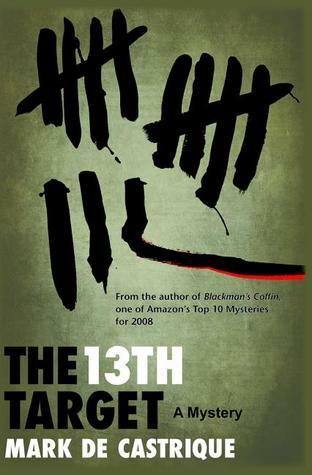 The 13th Target by Mark de Castrique is a fast-paced mystery that really picks up steam when Mullins teams up with a former colleague Amanda Church. She tells him of a suspicious transaction that she and Luguire had discussed shortly before his death. As they begin to investigate it, they discover that someone is setting Mullins up, making it look like he's behind a plot that could destroy the U.S. financial system. To clear his name, they have to stop a massive attack. They know the first 12 targets, but what is the 13th? The story in The 13th Target revolves around the U.S. Federal Reserve, and I have to admit I would have enjoyed it more if I went into it with a better understanding of how it works. There were certain details that, while de Castrique explained them, were still a bit confusing. But the storyline was interesting and the characters were complex. While some of the bad guys are revealed right up front, the mastermind behind it all was tough to uncover. I had my suspicions about several different characters, but never knew for sure until the end. If you're looking for a political thriller that is based within current events, this is a great choice. It has a protagonist that is likable, and plenty of twists and turns to keep you guessing until the end. This review was written based on a copy of The 13th Target that I received from Poisoned Pen Press in exchange for an honest review.